You’ve heard it a hundred times before, but summer grilling season is in full swing! 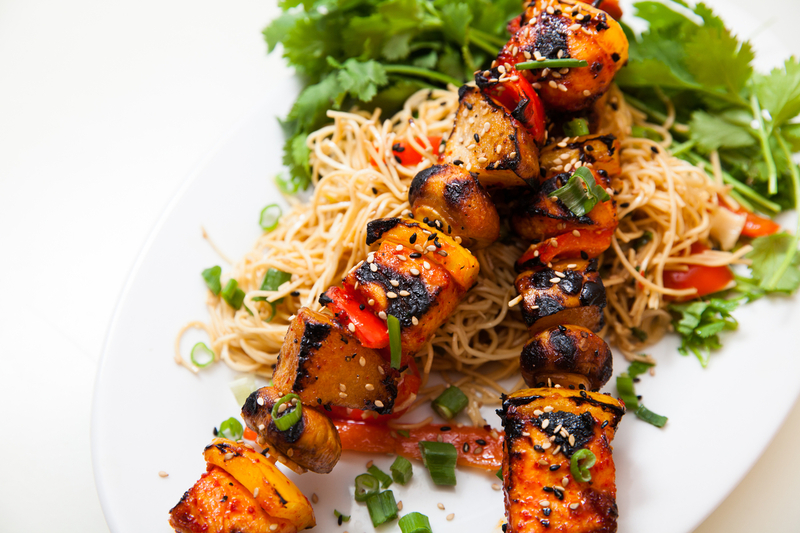 We tapped our chefs to share some cool skewer ideas that you can easily whip up on the grill at home. Enjoy several recipes, including a Lobster Boil Skewer from Shaw’s Crab House Chef Arnulfo Tellez stocked with lobster, potatoes, corn, sausage, and clams; a Korean-style chicken, veggie and fruit skewer with Asian pear, soy marinated mushrooms and yellow peppers from Chef Janet Kirker of Foodease and finally a Churrasco-style skewer of beef medallions with chimichurri salsa from Nacional 27 Chef Tim Hockett. 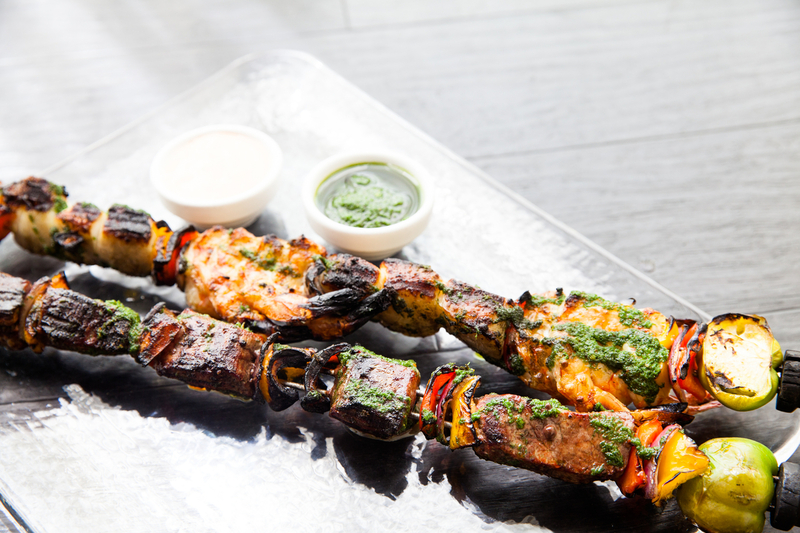 To prep any of these skewers, no matter how it’s stocked, Chef Tim Hockett from Nacional 27 recommends cutting your protein and veggies into small pieces and filling the skewers from end to end. Skewers 12 inches long are perfect for the grill. If using wooden skewers, soak them for 30 minutes in water before adding your ingredients. Now pick your protein. First on the grill, seafood. It seems basic but it is very important to clean all prior cooking debris that are left from your previous grilling sessions. Let your fish temper at room temperature for about 10-15 minutes prior to seasoning and placing on the grill. Lightly oil both sides of your fish/seafood and season liberally with kosher salt. The oiling of the fish will help aid in not sticking. Use a non-stick spray and lightly coat the cooking grate on the grill too. Trying to achieve more of a smokey flavor? For a charcoal grill, soak woodchips in water for 30 minutes before placing them directly on your charcoal to enhance your fish’s flavor. For a gas grill, soak woodchips in water 30 minutes before placing them in a smoker box and directly on the cooking grate. Place the fish skin-side down on the grill. Grill with your lid down. The fish will naturally release itself from the cooking grate once it is finished being grilled on that side. Do not agitate or try to move the fish if it has not released naturally – this goes for flipping your fish too, one flip, that’s it. General rule of thumb is eight minutes of cook time per inch of fish (total cook time, on medium-high heat). To flip your fish without damaging the skin, use a spatula. Tongs tend to damage the flesh of the fish. To maximize juiciness, allow your fish to rest for 3-5 minutes prior to eating/cutting. Try this at home. 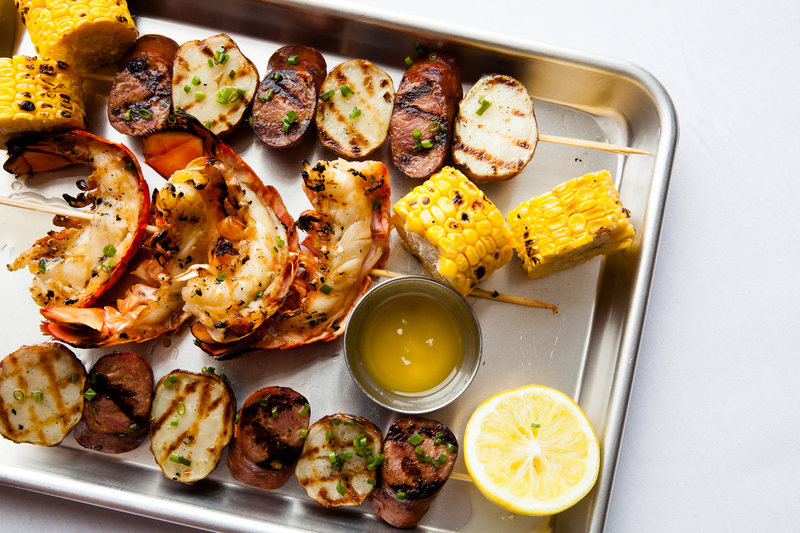 Here is Chef Arnulfo Tellez from Shaw’s Crab House Lobster Boil Skewer Recipe. In mood for red meat? Chef Hockett suggests marinating your beef in garlic, paprika, an acid (citrus or vinegar) and cayenne. Stick on some seasonal veggies from the Farmer’s Market, like peppers, mushrooms, grape tomatoes, onions or zucchini; all are great on the grill. Check out Chef Tim Hockett from Nacional 27’s recipe for Beef Medallions with Chimichurri Salsa. Full recipe here. Foodease Chef Janet Kirker shows us how to create a Korean-influenced skewer, full recipe here.